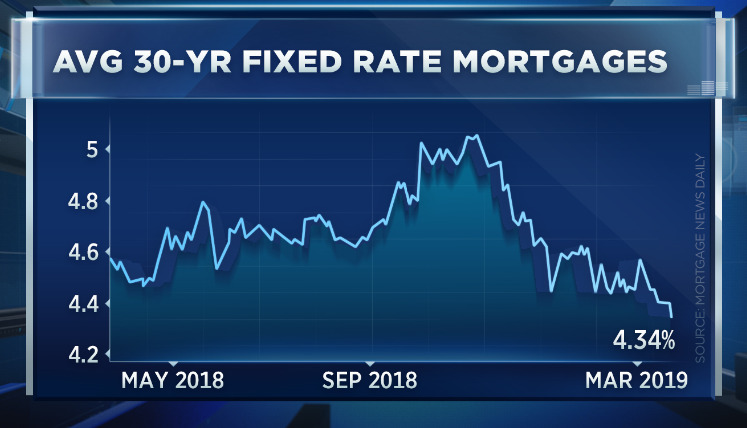 The move in mortgage rates followed Fed Chairman Jerome Powell's announcement that the central bank would end the so-called runoff of bonds from its balance sheet sooner than most expected. That caused the yield on the 10-year Treasury to tumble. Mortgage rates loosely follow that yield. "This is about as big of a change as anyone expected. It means the Fed will be buying more bonds more quickly," wrote Matthew Graham, chief operating officer of Mortgage News Daily. "And bond buying results in lower rates, all other things being equal." Even small rate moves can have a big impact on homebuying, especially since so many buyers today are facing overheated home prices and are therefore on the edge of being able to afford a home at all. Looking at the 30-year fixed rate on a $300,000 mortgage, every 25 basis point move down means a savings of $50 on a monthly payment. With the rate now down about 75 basis points from November, that's a savings of $150 per month. The drop in rates helps both potential buyers and current homeowners who might be able to benefit from a refinance — but it all comes with a caveat. The Fed isn't raising rates because the economy is weakening. "While a plus for homebuyers, if concerns about the economic outlook rattle consumer and homebuyer confidence, it could offset the benefit of lower mortgage rates," noted Danielle Hale, chief economist at realtor.com.